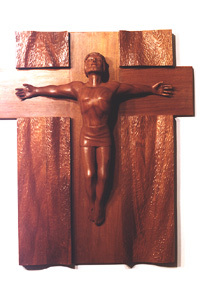 ANDRÉN & KNAPP - CROSSES, "Crucifix"
We like this crucifix because He seems triumphant. There are no nails, it is implied that he is there on the cross willingly and seems to be both suffering and flying at the same time. The message is that of a "Willing Sacrifice".